A Private Limited Company is a creation of law. It must comply with the provisions of the Companies Act, 2013. Specific activities have been described that must be followed immediately after the incorporation of the company. Some of them are listed in Companies Act, 2013 and some have been listed in other state-level laws like; Shops and Establishment Act, State Stamp Act, or professional tax. Post incorporation of a private limited company, there are many compliances that a company will have to follow. While some of them are mandatory, some are need-based, and others are optional. Convening of first board meeting: The board meetings are meeting of the directors that are held at least once in every quarter. This means that the gap between the meetings should not be more than 120 days. There is no limit on the maximum number of board meetings that can be held. However, the first meeting is very important to post incorporation. This is because various provisions of the Companies Act must be discussed in the first meeting. The decision to arrive at each such requirement is finalized here. Disclosure of interest by directors: Every director has to disclose his concerns and interest directly or indirectly through a contract or arrangement. Proposed contract or arrangement is decided in the first meeting of the board of directors. Such discussions are held annually. Any change in the interest of the director must be intimated to the board of directors within 30 days. Non-disclosure of any such relevant information makes the contract or arrangement voidable at the option of the company. 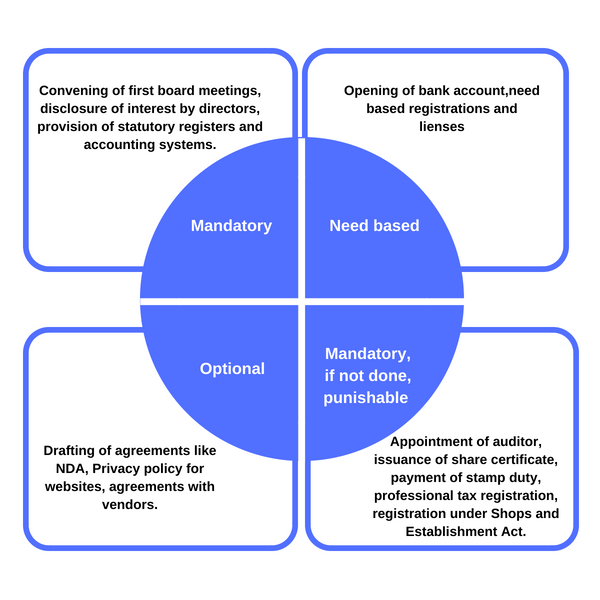 Provisioning of Maintenance of Statutory Registers: Every company is obligated to keep and maintain a certain register at its registered office. Failure to do so is an offense that can be fined and prosecuted. , as well as directors, are held responsible for the same. Developing of Accounting System for the company: Every company must prepare and keep books of accounts and other relevant financial statements at the registered office in accordance with the Section 128 of the Companies Act. This gives a true and fair view of the state of affairs for the company. For this purpose, it is required that double-entry bookkeeping is followed and records of the same are preserved for at least eight years. The accounts are maintained at the registered office address of the company or at any other place where directors decide under the guidance of ROC. Demand and collection of paid-up capital from the shareholder: The members of the company and its promoters subscribe equity shares. Signatures are put in the Memorandum of Association against the number of shares they subscribe for. The amount subscribed here has to pay an initial capital to the company after its incorporation. It is the duty of the directors to ask and collect money from the shareholders. Appointment of auditor within 30 days of incorporation: The appointment of the first auditor must be done within 30 days of the companyâ€™s incorporation. Post-appointment, an extraordinary general meeting of shareholders is called to announce the appointment of the auditor. The appointment through shareholders must be completed within 90 days. The issue of share certificate within 60 days: Within 60 days of becoming a shareholder of the company, the share certificate must be issued by the board of directors. In case of beginning a new company, the first subscriber shall be the shareholder from the date of incorporation. The share certificate is signed by two or one directors and company secretary of the company. The certificate must mention the folio number, share certificate number and a distinctive number of share for which the certificate is issued. Failure to do so within 60 days is an offense punishable by a fine of rupees twenty thousand. Payment of stamp duty on the issuance of share certificate: Each state government has its own laws governing the imposition of stamp duty on the issuance of share certificate. The stamp duty has to be paid to the respective state government after the issue. The mode of payment of stamp duty and its rates vary from state to state. Mostly, states charge 0.1% of the market value of shares as stamp duty. Non-payment is a serious offense punishable under law with imprisonments. Obtain registration under Shops and Establishment Act: In order to regulate the working hours and basic facilities provided to the employees or labor of the companies, each state has either passed its own law or adopted the law of other states to regulate shops and commercial establishments. Obtaining a registration under the law of shops and establishment must be done within 30 days of incorporation of the company or as applicable within the state. Failure to do so is a criminal offense. Professional tax registration of the company and its directors: All the directors, designated partners, and employers are required to obtain a professional tax registration. State governments impose a tax on the profession which is in the ambit of the industry. It is governed by the professional tax department and the tax is paid according to the prescribed rates. In contrast to this, certain states like Haryana, Punjab, Rajasthan and union territories like Delhi do not have any law regarding this. Protection of intellectual property rights: A company must not leave any opportunity in securing its intellectual property rights. This may be in the form of a symbol, logo, brand name, a punchline, or device marks. There are professional compliance specialists that are available to provide help regarding this as soon as the company is incorporated. Indian business ecosystem is mushrooming every day. Along with them are the specialist that help right from the stage of incorporation till the lifetime of the company. This helps them complete all its compliances. Are you looking for Private Ltd Company Registration in India? Legaldocs will guide you in getting all necessary Documents and Registration required to start Private Ltd Company in India, Please click on the following link to connect with our consultants.